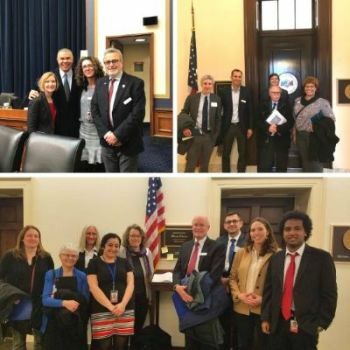 Yesterday (January 30), ASBMR leadership, committee chairs and members of the Advocacy and Science Policy Committee descended upon Capitol Hill in Washington D.C. to advocate for NIH funding as well as stable and predictable funding for research. Twenty-five ASBMR members spent the afternoon visiting a total of 28 congressional offices from 10 states and 11 congressional districts. Their message was clear: Support a $2.5 billion increase in FY20 for important research at the National Institutes of Health and predictable funding for scientific research in fiscal year 2020 and beyond. Capitol Hill Day participants also asked their representatives to support legislation that would amend title XVIII of the Social Security Act to improve access to, and utilization of, bone mass measurement benefits under part B of the Medicare program by establishing a minimum reimbursement for office-based DXA tests. 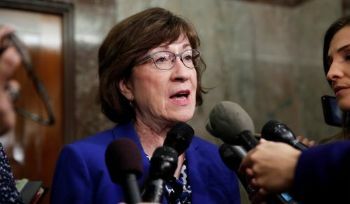 While ASBMR members were visiting their representatives yesterday during the Society’s Annual Hill Day in Washington D.C., Senator Susan Collins (R – Maine) reintroduced legislation in the U.S. Senate that would raise the minimum reimbursement rate for office-based DXA tests. Senate Bill S.283 would raise the Medicaid minimum reimbursement rate at $98. The bi-partisan legislation was introduced with the following co-sponsors: Senators Ben Cardin (D-Maryland), Marsha Blackburn (R-Tennessee), Angus King (I-Maine), Shelley Moore Capito (R-West Virginia), Roger Wicker (R-Mississippi) and Debbie Stabenow (D-Minnesota). We urge all U.S. members to contact their Senators and urge their support of S.283. The ASBMR Scientific Program Committee is seeking members who are willing to serve as abstract reviewers and oral session moderators for the ASBMR 2019 Annual Meeting, September 20-23 at the Orange County Convention in Orlando, Florida, USA. As an exclusive benefit of ASBMR membership, we invite you to take advantage of this opportunity to engage with fellow researchers, physicians and experts in the bone, mineral and musculoskeletal field by completing the volunteer form no later than Tuesday, February 12. ASBMR Travel Grant to the IFMRS Herbert Fleisch Workshop! Soft Bones: The U.S. Hypophosphatasia Foundation has officially opened applications for its 2019 Research Grant, offering two seed grants of $25,000 each for basic, clinical or translational research directly related to HPP. Founded in 2009, Soft Bones provides valuable information, education, and support for people living with hypophosphatasia (HPP), their families, and caregivers. Soft Bones is interested in promoting the development of innovative research by new and established investigators in 2019. Proposals are welcome from faculty members at a private research center or university. Applications from senior post-doctoral trainees or research associates are acceptable as long as the individual and his/her mentor have a record of commitment to research relevant to HPP. Please note that this grant cannot be used for investigator salaries or indirect costs. All applications must be received before Wednesday, May 1st in order to be considered, and the announcement of awardees will be made on June 5th, 2019. Please click here for more information about the grant (including past awardees) or click here to access the application. ASBMR Still Accepting Applications for Volunteer Leadership Positions! We need you! ASBMR volunteer leaders play an active role in developing and leading the worldwide research agenda in bone, mineral and musculoskeletal science. Nominate yourself or a colleague for a leadership position to actively contribute to ASBMR’s strategic goals, develop crucial leadership skills and make important career connections. The deadline for applications is March 11, 2019. Click here for more information, and to submit a nomination! ASBMR is partnering with the Network of Minority Health Research Investigators (NMRI) Annual Workshop to provide a $1,500 travel grant to send an early career investigator to attend this event. The major objective of NMRI and its annual workshop is to encourage and facilitate participation of members of underrepresented population groups and others interested in minority health in the conduct of biomedical research in the fields of diabetes, endocrinology, metabolism, digestive diseases, nutrition, kidney, urologic and hematologic diseases. A second objective is to encourage and enhance the potential of investigators in choosing a biomedical research career in these fields. To find out if you qualify and to begin the application, click here. The deadline to apply is Monday, February 19th.